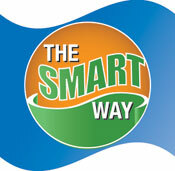 The Smart Way Bus is the regional public transportation service operated by Valley Metro. It links the Roanoke Valley and the New River Valley for a fare of only $4.00, each way. The Smart Way begins service at Campbell Court, with stops at the Hotel Roanoke, the Roanoke Regional Airport, two park and ride lots along Interstate 81 at exits 140 and 118A, the Christiansburg K-mart (at the shelter going to Tech and across the street from the shelter going to Roanoke), the Virginia Tech Corporate Research Center, Main Street in downtown Blacksburg, and the Squires Student Center on the Campus of Virginia Tech. Check our web link below to see the map and the schedule for this deviation. The Smart Way Base service departs Virginia Tech/Squires Student Center at 5:00a.m., with passenger stops in Blacksburg, Exit 118 (Christiansburg Park and Ride), and in Roanoke, adjacent to the Amtrak platform at 5:40 a.m.